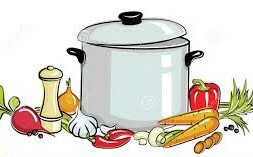 The Simmering Pot provides weekly wholesome and nutritious meals free of charge to anyone, regardless of income, in the Blue Hill Peninsula community. Ingredients are sourced as locally as possible, supporting local farmers. More than one hundred dinners are served each week. On the first Monday of every month, volunteers from Blue Hill Memorial Hospital generously prepare the dinner. Meals are served in Jonathan Fisher Hall at the Church, Mondays from 2:30 to 6:00pm year-round, except major holidays. All are welcome to eat in or take out. There is never a charge, but a donation basket is available. Donations from individuals and businesses help sustain the program. If you would like to volunteer with preparing, serving, or cleaning up, please contact Mary Hildebrand at (207) 664-9661 or Paula Mrozocki at (207) 664-8372.